Dumpling time used to be a two person project in my family. One person rolled out wrappers, the other wrapped. By two people, I mean my parents. My only job was to eat. After I became vegetarian, dumpling time became a three person project. There are two different fillings now – meat and veggie. I’m in charge of wrapping my own veggie dumplings, dang it. First we make the dough and let it rest for an hour. Roughly, the ratio of flour to water is 2:1. If the dough is tight, it’s too dry. Sprinkle on some water. If it’s sticky, keep kneading in generous sprinklings of flour. In the end, the dough should be smooth, soft, and elastic. If it isn’t, you can always rework it and let it rest some more. There are endless filling combinations. In the north, cabbage and pork is popular, but I’m a Southerner, so we always use Chinese chives, also known as garlic chives and Chinese leeks. We don’t do cabbage. Too beige. 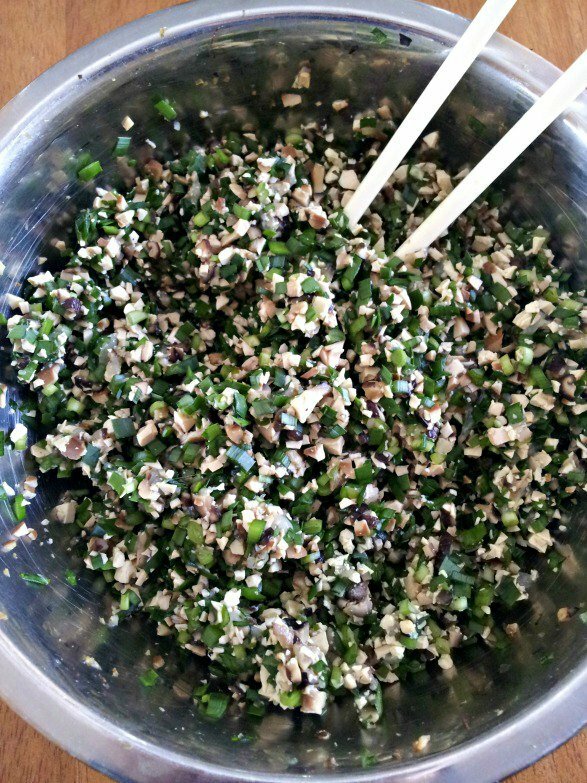 Here we mince the chives, bean curd, and shiitake mushrooms (we do this by hand with a huge cleaver, but you can probably speed up the process in a food processor). Then we crack in an egg and mix it all up with a dash of toasted sesame oil and a sprinkle of salt. That’s it! The filling’s the easy part. [columnize] [/columnize]Next we generously dust a tray with flour so the dumplings don’t stick. 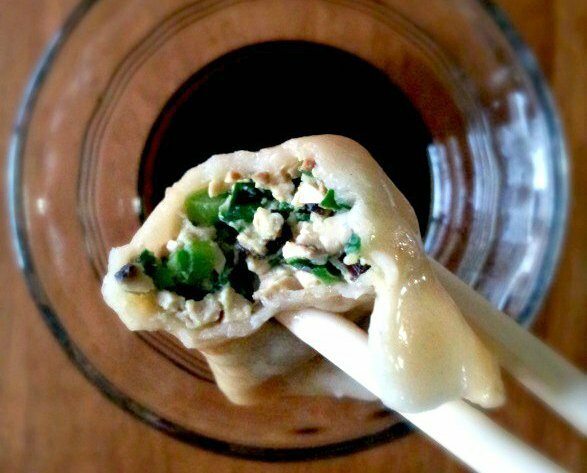 Stretch the dumpling dough into one long noodle, about 3/4 of an inch thick. Rotating the noodle back and forth, cut it into 3/4 inch pieces. Flour your cutting board (with a lot of flour!) and flatten each disk with the palm of your hand. The trick is to roll the disk from the outside in as you keep rotating the disk. This keeps the edge thinner than the center. 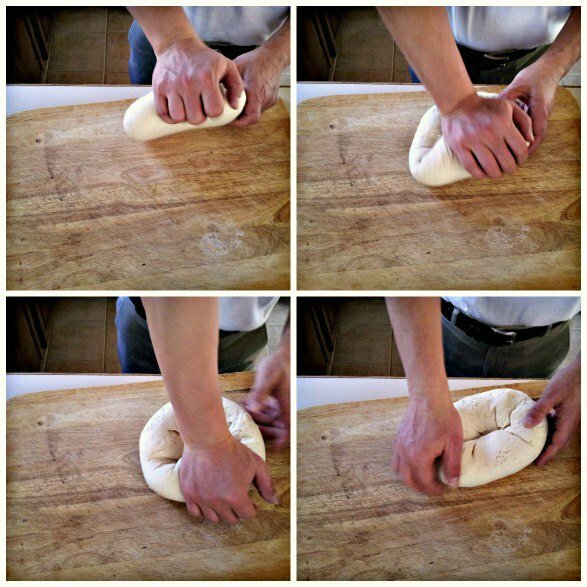 When you crimp the edges together later on, the thickness of the dough will stay uniform. If you’re right handed, hold the disk with your left hand, roll back and forth towards the center with the palm of your right hand, and keep rotating the disk with your left. Fast! There should be a slight rotation with every roll. 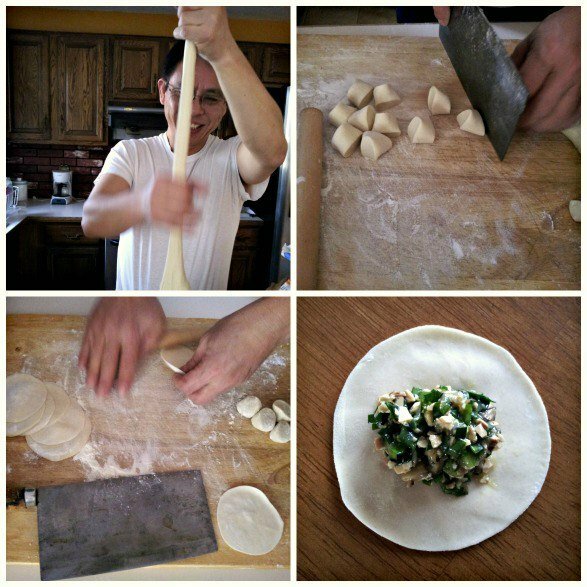 My dad churns out dumpling wrappers at lightning speed. Or just buy dumpling wrappers at your local Chinese grocery. But they won’t be as deliciously chewy! 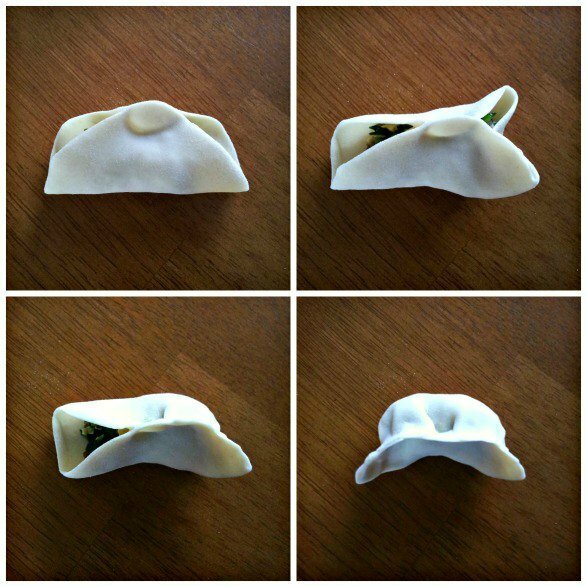 To wrap the dumplings, we spoon a little filling in the center of each wrapper, pinch the edges together in the center, then pinch each side together in folds. Lastly, press the edge firmly all the way around to seal the dumpling. 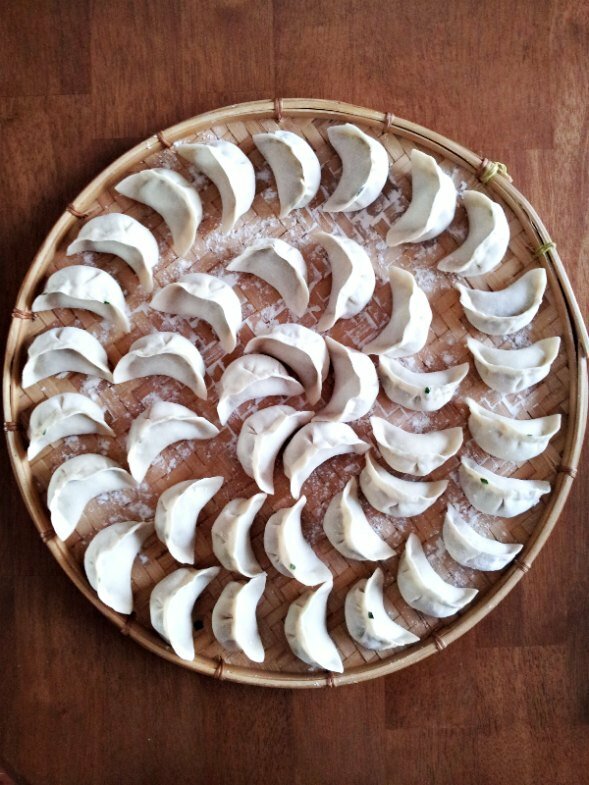 I make plump crescent shaped dumplings. My grandpa makes flat ones. Mine are totally prettier. Practice makes perfect! 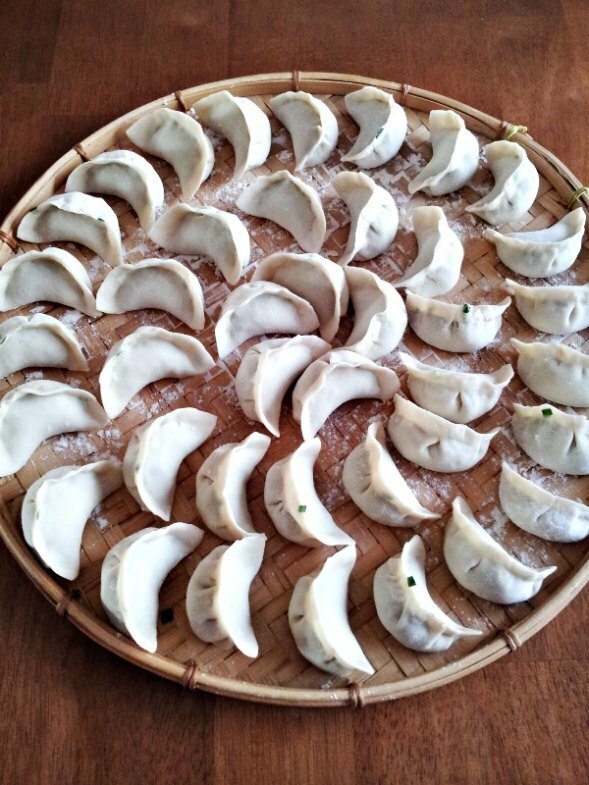 Bring a large pot of water to a boil and drop in the dumplings 15-20 at a time. Don’t overcrowd the pot. When the wrappers become slightly translucent, the dumplings are ready. You can freeze the rest if you don’t plan on boiling all of them immediately. Just remember to give the fresh dumplings a good dusting of flour so they don’t stick to each other in the freezer. Dip in soy sauce, vinegar, and more toasted sesame oil. This moment is worth the toil. Mix the flour and water with a fork. Flour a cutting board and knead the dough well for several minutes. Let it rest under a damp cloth or plastic wrap for an hour. Check the dough to see if it is elastic, soft, and smooth. If it's hard, then it's too dry. Sprinkle on a little water and knead again. If it's shaggy, sprinkle on flour and knead again. Let it rest for 10-15 minutes after the second kneading. Prepare the filling by mincing all the ingredients and tossing them together. 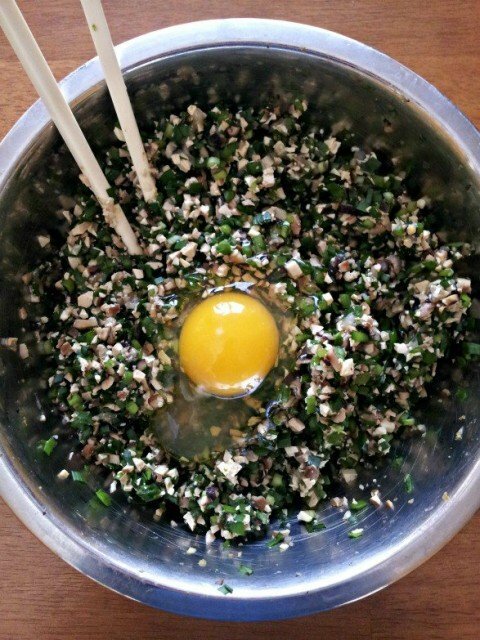 When you are ready to wrap, crack an egg over the filling, mix, then add salt and sesame oil. Break off a section of dough and pull it into a long snake like shape. It should be 3/4 to 1 inch in diameter. Roll it back and forth on the cutting board until it is rounded, then cut into 3/4 inch pieces. Flatten each piece into a disk, making sure the surface of the cutting board is well floured. Using a back and forth motion, roll the disk from the outside edge towards the center, continuously rotating the disk with your other hand. 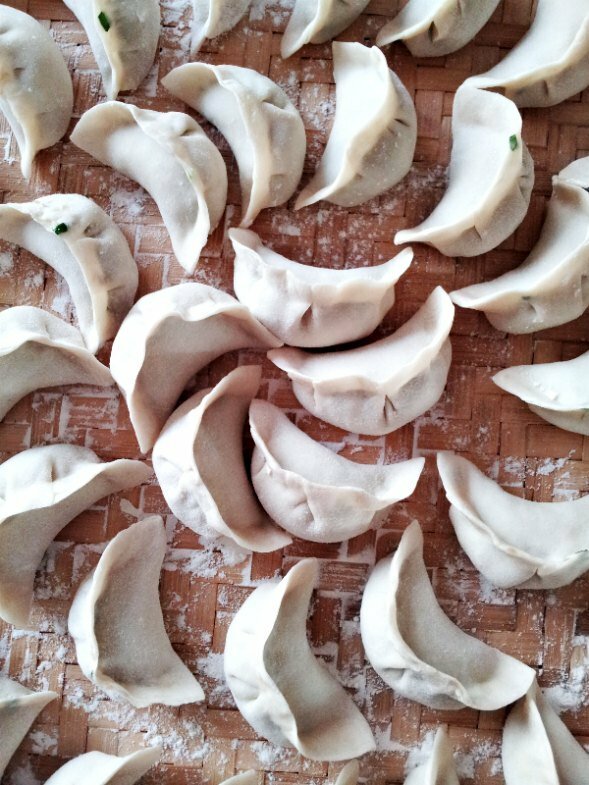 To wrap the dumplings, place a small mound of filling in the center of each wrapper. Pinch the edges together first in the center, then both sides, pressing firmly to seal the wrapper. Make sure there are no leaky air pockets. If you're using store bought wrappers, you will need to moisten the inside edge with water, so keep a small bowl of water nearby. Place the dumplings on a well floured tray. Don't stack them or else they will stick. When all the dumplings have been wrapped, bring a large pot of water to a boil and gently drop in 15-20 dumplings at a time. Boil until the wrappers turn slightly translucent, about 5-8 minutes, stirring occasionally. When the dumplings are done, scoop them onto a plate with a slotted spoon. You don't have to boil all the dumplings. Dust the unboiled ones generously with flour and store in the freezer. These will keep for up to a month. 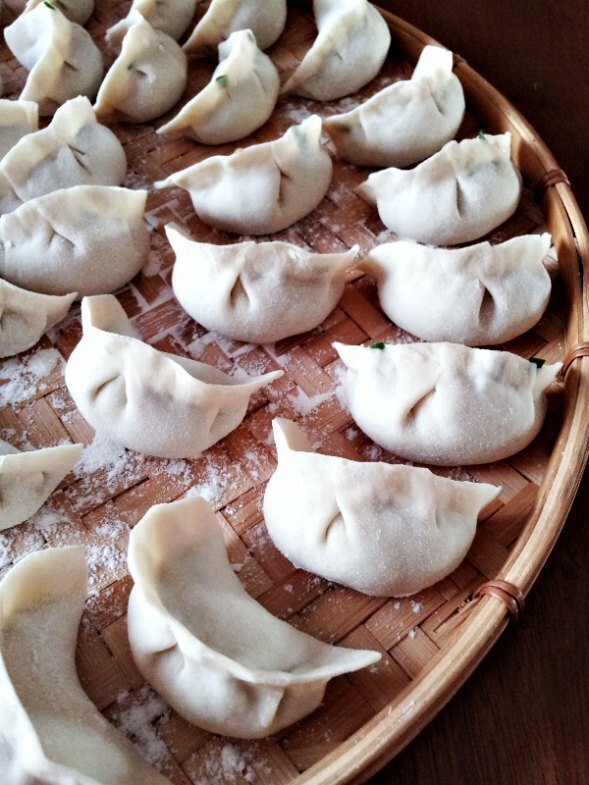 To cook frozen dumplings, drop them into boiling water directly from the freezer, without defrosting. Hi Philip, the egg really helps the filling stick together so it’s much easier to wrap, but it’s not necessarily if you hate eggs haha! 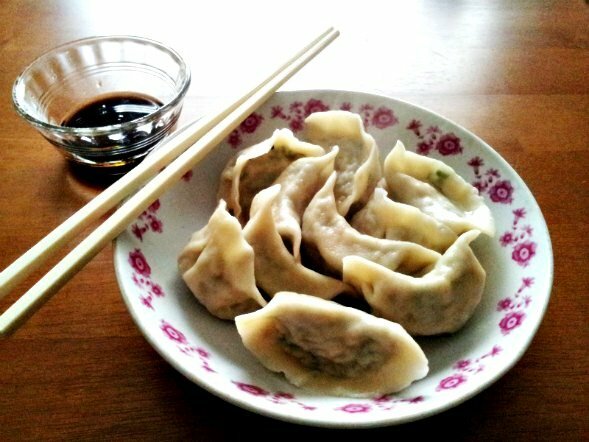 so, i made hese lovely dumplings today as it is the food i miss the most since i turned vegetarian! Soooo grateful for this recipe! 🙂 the dough took me a while to make as it was too sticky almost the entire time. Unfortunately, my dumplings turned out looking pretty grey, any tips for that? The sauce was great and also the filling tasted really good. Only thing was my dough which didn’t completely satisfy me. I will try buying it next time and see if it would turn out any nicer that way. I just used tofu as there was nothing else available in the store and normal chives. Hi Annika! I’m so glad you gave these a try. What brand/type of flour did you use? I’m not sure about the grey color, but try using less water in the dough next time. Just add a bit at a time until the dough comes together. Or add more flour if the dough gets too sticky. It should feel smooth and floury on the outside but very elastic when you pull on it. Hope that helps! I will try measuring the flour by weight next time I make this recipe and will let you know when I post an updated version. Andrea, did you boil the dumplings for at least 5 minutes? You can try returning them to a pot of boiling water or steam them. It shouldn’t take long for the filling to cook since the bean curd is already pre-cooked. They’re also meant to be eaten with the dipping sauce for flavor. These look delicious! Thank you for such detailed steps! I can’t wait to try it out! Hope you enjoy them Jessie! Dumpling time is my favorite time!